I haven’t shared an entire day of Mother Goose Time lately, so this post is of course a bit overdue. Today was all about Pipes & Plumbers and we definitely had lots of fun learning about both. We started with the Pipe Sculpture activity. 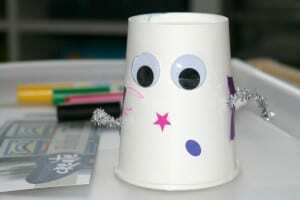 One of our favorite activities this week was the Robot Tinkering invitation to create. The new process art experiences from Mother Goose Time always exceed my expectations and this one was definitely no exception. The skills listed for this activity were Shapes (16.2) and Logic (20.1). The little guy and I had lots of fun working on an Upcycle Collage invitation to create process art experience, except when it was all said and done, we didn’t end up making a collage after all. Whoa. Wait a sec! You mean, we made something, but didn’t actually make anything? Talk about an oxymoron, right? We’ve been at home full-time for a few weeks now and we’re right where we should be for the month with Mother Goose Time. Yay! It’s all kinds of awesome to finally be doing things in real time. It used to be that we’d do lots of stuff on the weekends and hardly anything during the week.